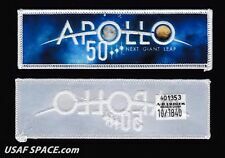 WE HAVE EVERY ORIGINAL SPACEX Mission PATCH LISTED FOR A LOW PRICE --. THIS - ORIGINAL - FULLY EMBROIDERED Lockheed Martin Mission PATCH IS IN - MINT - CONDITION. Apollo - Soyuz. th Anniversary Apollo. 1962 - 2012. Space Shuttle Columbia STS-1. Space Shuttle pin with flown material. Space Shuttle Atlantis, with flown material. Apollo 11 Pin with flown material. THIS - ORIGINAL - FULLY EMBROIDERED SPACEX Mission PATCH IS IN - MINT - CONDITION. 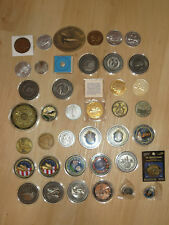 MORE GREAT PATCHES ,CHALLENGE COINS, FLOWN. Beleg mit Schiffstempel USS Noa 20.2.1962 und Originalunterschrift John Glenn Jr. Noa a7 15:01. Ungarn Apollo 16 Gedenkblock mitAutogramm Paul Weitz. THESE ARE THE PATCHES GIVEN TO THE GUEST OF SPACEX & LOCKHEED MARTIN. CHECK BACK HOPE TO HAVE THE CLOVERLEAF SPACEX PATCH SOON. "LOCKHEED MARTIN SPACE". LIMITED NUMBER OF THE OFFICIAL LOCKHEED MARTIN PATCH. 4" NASA MARS ROVERS PATCH NEW. Patch is made of 100% embroidery and features a plastic backing. Official SpaceX Nusantara Satu mission patch. THIS - ORIGINAL - FULLY EMBROIDERED SPACEX Mission PATCH IS IN - MINT - CONDITION. MORE GREAT PATCHES ,CHALLENGE COINS, FLOWN. Electron 5 Launch Vehicle Patch. The patch is 4” in size and is in mint condition. (20x25 cm). Es handelt sich um einen neuen Abzug auf hochwertigem Hochglanzfotopapier. Das Autogramm ist Bestandteil des Fotos (Repro-Autogramm). New photo print on high quality photo paper. The autograph is part of the photo (repro autograph). THIS - SPECIAL - ORIGINAL - FULLY EMBROIDERED 5" - 6" SPACEX Mission PATCH IS IN - MINT. 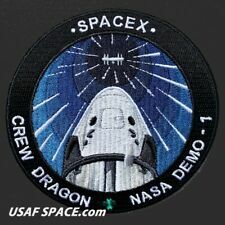 -- WE HAVE EVERY ORIGINAL SPACEX Mission PATCH LISTED FOR A LOW PRICE --. USAF 95TH FIGHTER SQUADRON - F-15 ERA - Tyndall AFB, FL - ORIGINAL AIR FORCE PATCH on HOOK & LOOP BACKING. - Double-sided backing (hook and loop) -. THIS IS A SPACEX NASA DEMO-1. NASA DEMO-1. CREW DRAGON. DEMO FLIGHT WAS CONDUCTED MARCH 2 2019. (THE T-SHIRT YOU WILL RECEIVE IS THE ONE STILL IN THE PLASTIC SHOWN IN PICTURE). 100% COTTON. THE BACK OF THE T-SHIRT. THIS IS A SPACEX NASA DEMO-1. NASA DEMO-1. CREW DRAGON. DEMO FLIGHT WAS CONDUCTED MARCH 2 2019. (THE T-SHIRT YOU WILL RECEIVE IS THE ONE STILL IN THE PLASTIC SHOWN IN PICTURE). THE BACK OF THE T-SHIRT. USAF 23rd EXPEDITIONARY BOMB SQUADRON -AGGRESSOR- Minot AFB, ND - ORIGINAL AIR FORCE PATCH on HOOK & LOOP BACKING. - Double-sided backing (hook and loop) -. USAF 493rd FIGHTER SQUADRON -REAPER EAGLE DRIVER- RAF Lakenheath, ENGLAND - ORIGINAL AIR FORCE PATCH on HOOK & LOOP BACKING. - Double-sided backing (hook and loop) -. The Spaced-Based Infrared System (SBIRS) replaces the current Defense Support Program (DSP). Recent budget revisions, however, have caused a redefinition of the SBIRS Low program, with emphasis on further sensor research efforts. USAF F-35 LIGHTNING II CLIMATIC TESTING - McKINLEY CLIMATIC LAB - ORIGINAL AIR FORCE PATCH on HOOK & LOOP BACKING. THIS - ORIGINAL - FULLY EMBROIDERED 3.75" USAF PATCH on HOOK & LOOP BACKING IS IN - MINT - CONDITION. SMC is the U.S. Air Force's center for acquiring and developing military space systems. SIGNED NASA PHOTOS. USAF MC-12 LIBERTY - 1000 HOURS - MC-12W - ORIGINAL AIR FORCE PATCH on HOOK & LOOP BACKING. THIS - ORIGINAL - FULLY EMBROIDERED 3.5" USAF PATCH on HOOK & LOOP BACKING IS IN - MINT - CONDITION. MC-12 LIBERTY. USAF LOCKHEED SKUNK WORKS - U-2 - PROJECT HUNTER - NORTHERN EDGE 2017 - ORIGINAL AIR FORCE PATCH on HOOK & LOOP BACKING. -Link 16 radio -Enhanced Link 16 fighter to fighter OMS capability integration The demonstration focused on advanced communications and interoperability between systems through the use of a U-2 as a vital communications and processing node, connecting a web of systems across multiple domains and enabling complete battlespace awareness. USAF 69TH EXPEDITIONARY BOMB SQ-Minot AFB, MT- B-52 ORIGINAL AIR FORCE DESERT MORALE PATCH on HOOK & LOOP BACKING. - Double-sided backing (hook and loop) -. NASA LITHOS AND SPACE COLLECTIBLES ARE LISTED. MORE GREAT PATCHES ,CHALLENGE COINS, FLOWN. NASA LITHOS AND SPACE COLLECTIBLES ARE LISTED. US residents. 50 extra per patch, International 1.00 extra per patch. THIS - RARE - ORIGINAL - FULLY EMBROIDERED USAF. PATCH on HOOK & LOOP BACKING IS IN - MINT - CONDITION. - Double-sided backing (hook and loop) -. USAF 391ST EXPEDITIONARY FIGHTER SQUADRON -CHECKERED FLAG 2017-01-AIR FORCE PATCH SET on HOOK & LOOP. THIS FULLY EMBROIDERED - HOOK & LOOP BACKED 4" USAF PATCH IS IN - MINT - CONDITION. - Double-sided backing (hook and loop) -. USAF 194TH, 67TH & 44TH FIGHTER SQUADRON - GRIFFCOCKPIRE EAGLE DRIVER - RED FLAG 2018 - 02 - ORIGINAL AIR FORCE PVC PATCH on HOOK & LOOP BACKING. - Double-sided backing (hook and loop) -. 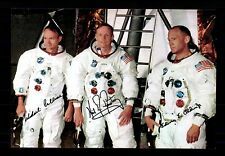 SIGNED NASA PHOTOS. Double-sided backing (hook and loop) -. SIGNED NASA PHOTOS. RARE BEAUTIFUL ORIGINAL USAF STICKER IS 4" AND IS IN - MINT - CONDITION. ARE LISTED. SPACE COLLECTIBLES. NASA LITHOS. SIGNED NASA PHOTOS. USAF 34TH FIGHTER SQUADRON - F-35 SCHWARMA - Hill AFB, UT - AIR FORCE ORIGINAL - PATCH on HOOK & LOOP BACKING. THIS - ORIGINAL - FULLY EMBROIDERED - 4" - USAF PATCH ON HOOK & LOOP BACKING IS IN - MINT - CONDITION. USAF 422d TEST & EVALUATION SQ -F-16 GREEN BATS- Nellis AFB, NV - ORIGINAL AIR FORCE PATCH on HOOK & LOOP BACKING. NASA LITHOS AND SPACE COLLECTIBLES ARE LISTED. SIGNED NASA PHOTOS. Repro-Autogramm von Neil Armstrong(ca. 20x25 cm). Repro autograph of Neil Armstrong (approx. 20x25 cm). Es handelt sich um einen neuen Abzug auf hochwertigem Hochglanzfotopapier. Das Autogramm ist Bestandteil des Fotos (Repro-Autogramm). L-45 TBD 2015-09-15 VAFB SLC-6 Delta IV M (5,2) Low Earth Topaz Awaiting launch. THIS IS THE LAUNCH PATCH FOR THE UPCOMING NROL-45 MISSION. SIGNED NASA PHOTOS. 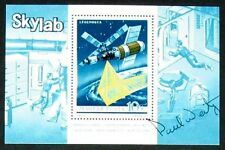 NASA LITHOS, AND SPACE COLLECTIBLES ARE LISTED. WHAT HAPPENS 84 MI. NW OF LAS VEGAS STAYS 84 MI. OF LAS VEGAS USAF AREA 51 PATCH. THIS VERY UNCOMMON FULLY EMBROIDERED PATCH IS 4" AND IS IN - MINT - CONDITION. NASA LITHOS AND SPACE COLLECTIBLES ARE LISTED. USAF 23rd BOMB SQUADRON - B-52 - C FLIGHT - Minot AFB, ND - ORIGINAL AIR FORCE PATCH on HOOK & LOOP BACKING. - Double-sided backing (hook and loop) -. NASA LITHOS AND SPACE COLLECTIBLES ARE LISTED. THIS - ORIGINAL - FULLY EMBROIDERED - HOOK & LOOP BACK 4" USAF PATCH IS IN - MINT - CONDITION. - Double-sided backing (hook and loop) -. 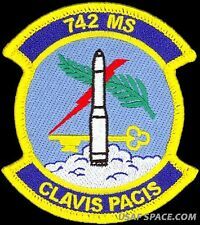 TF-214 Mission in Support of USSTRATCOM Perform credible, around-the-clock nuclear deterrence operations; when directed by the President of the United States, conduct rapid, accurate, and decisive global ICBM strike. Original signiertes (hand signed) NASA Grossfoto (20x25cm) von kevin P. Chilton - mit Widmung. (kein Druck, Autopen, Kopie oder ähnliches). Ich versuche herauszufinden, ob das Foto einem Urheberrecht unterliegt oder nicht. USAF 18TH OPERATIONS GROUP -F-15- GAGGLE - Kadena AB, Japan - ORIGINAL AIR FORCE PATCH on HOOK & LOOP BACKING. - Double-sided backing (hook and loop) -. SIGNED NASA PHOTOS. NASA LITHOS, AND SPACE COLLECTIBLES ARE LISTED. SIGNED NASA PHOTOS. USAF 321st MISSILE SQUADRON -Minuteman III- Warren AFB, WY - AIR FORCE PATCH on HOOK & LOOP. THIS ORIGINAL FULLY EMBROIDERED - HOOK & LOOP BACKED 3.5" USAF PATCH IS IN - MINT - CONDITION. - Double-sided backing (hook and loop) -. Autograph Valentina Tereshkova 1st Woman in space signed Original 8x10"
Es ist in einem guten Zustand und stammt aus einem Nichtraucherhaushalt. Es hat die Maße von etwa (etwas kleiner) 20 x 30 cm. It is in a perfect condition and has a size of approx. I got it approx.